Type 6901 Oilfield Suction Hose is an economical suction and discharge hose option for crude and waste oil when a tank truck hose is not necessary. Use in unrefined product and waste transport, crude oil and drilling mud. 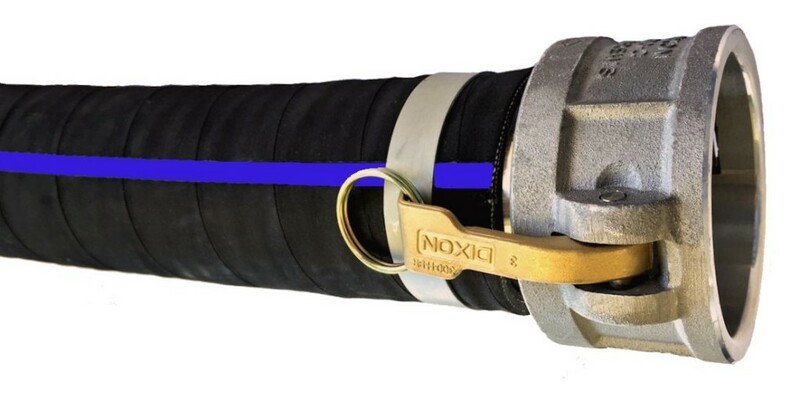 This hose can also be used to transfer cooking grease (at ambient temperature). A high tensile spring wire offers full vacuum, durability, and a means for grounding the assembly. A suitable option for water and waste suction in environments where the hose may come into contact externally with oil or oily waste. Shown with optional cam lock quick connect coupling, bulk hose and other coupling configurations available. WARNING: This product contains carbon black, a chemical known to the State of California to cause cancer, birth defects or other reproductive harm. Do not use in connection with drinking water. Wash hands after handling. Visit www.P65warnings.ca.gov for additional information.